That carries an empty car. The above song was written for Woody Guthrie, but it also says a lot about its author Andy Irvine. 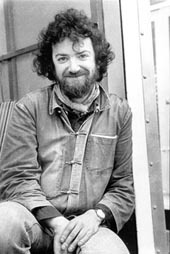 Not only do his lifelong reverence for Woody, his championing of those who work for small wages, his admiration of the "Wobbly" movement - the International Workers of the World - and his distrust of politicians shine through; "never tire of the road" could serve as the guiding motto of Andy Irvine's life and career. He has always delighted in travelling, it seems, and he also appears to have found it hard to put down roots. Looking at him it's not easy to believe Andy has just turned sixty. On the other hand, he seems to have been around on the folk scene forever. His musical career is associated with some of the most illustrious names to come out of Ireland: Sweeney's Men, Planxty, De Dannan, Paul Brady, Patrick Street. He is also a highly respected soloist both as a singer and as an instrumentalist. 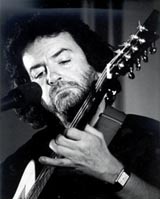 I undertook to interview Andy Irvine at the Tanz- und Folkfest Rudolstadt in 2001. He claimed not to be in the mood for interviewing as he was scheduled that afternoon for a talk imaginatively titled "Andy Irvine: From a folksinger's life" (which helped this article along considerably). Reluctantly, I switched off my tape recorder. It was then he started to talk, and to this day I could kick myself for not switching it back on again! The talk ahead triggered memories of his travels in the Balkans in the Seventies, a carefree time when he discovered a new kind of music, found new friends and fell in love with a girl for all the wrong reasons. I think what he said was: "Although I did really love her while it lasted I fell in love as much with what she stood for, you understand - with her country, her background, the whole atmosphere." His thoughts switched to his love of books, how he doesn't like being interrupted once he has found an absorbing one and can go on reading for days on end. He particularly likes history books and biographies. This is where he finds much of the raw material for such songs as A Prince Among Men (about an unnamed miner), Raoul Wallenberg (about the Swedish diplomat who saved thousands of Jewish lives during World War II and was, it now seems, arrested and killed by the Soviet secret police), Forgotten Hero (about Michael Davitt, the founder of the 19th century Irish Land League), Gladiators (about some members of the Industrial Workers of the World who left their mark on history). The IWW is a particular concern of his, and he has been a member for a few years now. Andy has a very well organised website (http://www.andyirvine.com) which, he says, was put together for him and is run by a fan, Kate Akers. It, too, has helped with this article, because once it was there Andy decided to include something autobiographical. "I thought I'd better write a page of who I am. And suddenly I'd written about five pages, and I was still only in my childhood. So I thought - no no no, you've got to try and condense this! But I couldn't get it boxed. So I thought, well, in that case I might as well write, a not-brief synopsis of who I am." He ended up with nine chapters. They gave him the incentive to start on his autobiography, which he is writing at the moment. "I'm not doing it for anything but personal reasons, and I have no idea when it will be finished. I think it will be quite nice for my children - they are in their twenties. I know from experience that in your twenties you have your own life to live. You don't worry very much about your parents and who they were - who they are. So, somewhere in their forties they'll be pleased that I left them a record." Incidentally, this was the only time that whole afternoon that he mentioned his family, other than indicating that his marriage had been a casualty of his travelling lifestyle. Andy Irvine comes across almost as two different people: one, distant and withdrawn, preferring to be left alone; the other, outgoing, trusting and eager for every new thing life might hold in store. Maybe it's because he is a Gemini, but certainly his childhood in London must have played a part. He describes his family as "middle class / bohemian" - his father being a chartered accountant from Glasgow, a "strange" man who used to beat his young son, his mother an actress from County Antrim who went on playing roles all her life and often used her embarrassed son as an audience. "I was the only person in the world who didn't appreciate my mother's talent, which I'm really bitterly sad about - because if any of my talent is inherited it's not from my father. So I owe her a great deal of gratitude, and when I was a small boy I didn't in any way show that." He also had a half-sister. Due apparently to tensions within the family he was sent away to boarding school at a very early age - which explains why he has very few memories of his early childhood. "I think I was in a state of trauma from the age of three-and-a-half to about nine or ten." He made all this sound funny in his talk, but it also came across as a very sad time for him. Andrew - as he was always called by his family - became a child prodigy at nine, not as a musician but as an actor. His debut was in a 1955 film starring Gina Lollobrigida. "It wasn't a very good film, and I never did meet Gina, but I was good, you know. It is very easy to act when you're that age." This feat gave him a better standing among the boys at school and boosted his self-confidence. Later on, when he was offered a part in what he calls a "children's soap opera" he was able to leave the boarding-school that he loathed and pursue his career in stage shows and TV productions. His musical education had been provided by a wind-up gramophone and a hoard of "half-broken seventy-eights" as well as by his mother's singing of her old stage songs. By the age of fifteen all his friends were into rock 'n' roll, but "I was waiting for the kind of music that I liked, and it didn't appear". Finally, in 1956, he discovered Lonnie Donegan and Skiffle, then Woody Guthrie. "I didn't know much about Woody. I'd seen his name on the back of a Lonnie Donegan cover and I thought, what a great name! I'd love to be called Woody!" After finding one of Woody's albums in a record shop, Andy tried to write to him. "I sent him this air mail letter (which I still have because it came back to me) to 'Woody Guthrie, USA'. - So Woody kind of took over my life in 1958." He discovered that his hero was in hospital in New Jersey, suffering from an incurable wasting disease, Huntingdon's. His next letter was answered by Sid Gleason who, with her husband Bob, looked after Woody. She would relay young Andy's questions to him and write down the answers. "I used to write him really long letters. He was an outlet for me. My home life wasn't very happy - my parents didn't get on very well, they drank much too much and had fights. Now, Sid seemed really nice, really motherly, and I thought, I'd like to go over there and live with them! I could meet Woody and be part of that scene!" The Gleasons seem to have agreed to the plan. Sid even asked permission to sign her letters 'Mom', and she was the first person to call him Andy. By the time he was seventeen his parents were resigned to letting him go to the States in search of a new family. It never happened, though. By this time, he had also met Ramblin' Jack Elliott in London. "He had actually travelled with Woody, and he was the nearest thing you could get to Woody. I desperately wanted to talk to him, but he was surrounded by people." Young Andy had an idea: "I'll wait outside and stalk him and his wife, find out where he lives, and then send him a letter. So I did - every bus they got on I got on behind them, every train they got on I got on behind them. Eventually they got to this house, and I ran up to the door - right, it's number 13! Whatever the address was." Jack Elliott rang him to invite him over. "I'm sure he must, at some stage in the next two months, have wished he'd never made that phone call, because every morning at about eight o'clock I'd cycle over to his house, knock on the door, and either himself or his wife would open the door and go [drowsily], 'Oh, it's you! ', and I'd sit on the end of their bed until they got up - which must have been a real pain!" Another constant visitor was Davy Graham, who would practise on Jack's guitars for hours. Andy had started playing the mandolin, and he and Jack made tapes together for Woody to listen to. "We sang This Land Is Your Land or something, and I was doing the Cisco Houston harmony and he was being Jack Elliott and doing the guitar and the vocal. And he looked at me and in amazement he said, 'Jeez, Andy, you sound more like Woody than I do!' And I thought, "Ahhhhhhh, that's fantastic!' because Woody had said to him, 'Jeez, Jack you sound more like me than I do'." He realised there was music beyond Woody when he discovered a two-LP collection of 'old-timey' American folk music by Harry Smith on Folkways Records. "It was what had come down to the American people from the settlers who had brought pieces of their own folk music from various different countries. I thought it was really great, because much of it was quite primitive, in a positive way." He believes it has had quite an influence on his idiosyncratic musical style. By the early '60s he found that acting didn't come as naturally to the young man as it had to the child. He became self-conscious and began to hate acting, though he avoided letting his parents know. His dream of joining Woody in the States faded when his mother died; at the same time, he was offered a role he felt he couldn't refuse in a BBC radio series. The money and the fact that he didn't have to learn his lines and only act with his voice kept him going. Also, he had found a new field of interest. "I'd started going to Ireland at this time and I found a whole bunch of people who were really into the same kind of thing as I was. It wasn't just the music, it was the lifestyle - a combination of bohemian-ness and socialism. I'd picked up on socialism from Woody early on. (How did I avoid being beaten up by fascists in London at various demonstrations we had at that time?) We were outside the mainstream of society in a way. We were wearing clothes like - well, more or less like the ones I've got on now [jeans, sweatshirt, denim jacket]. People like Johnny Moynihan were really good friends of mine, and I decided to go and live in Dublin. I couldn't give up acting because that was my meal ticket, and I acted in Dublin for a couple of years until this kind of bohemian life became complete. I lived on nothing. If it hadn't been for a certain pub called O'Donoghue's I'm sure half of us would have starved. I eventually got a flat opposite O'Donoghue's and would go in there in the morning and Maureen O'Donoghue would give me a bowl of soup and a pint. It was a fantastic life!" It was, it seems, a life ruled by drink and music. Andy started singing with Johnny Moynihan and others. "We were so idealistic that we didn't like to play for money - but we didn't like to get ripped off as well. We got a gig out in the Abbey Tavern in Holt once. I was singing this great long ballad, I think it was The House Carpenter. Halfway through Johnny leaned over and whispered into my ear - he could scarcely stop from laughing, and he said, 'Andy, there isn't one person in the place listening to you!' I continued singing with knitted eyebrows, and I looked up, and I looked around - and there wasn't one person listening, not even ONE! That was the beginning of what they called the ballad boom, and if you didn't sing 'We're all off to Dublin in the green, in the green' - and we didn't - then you were something else." From this position, Andy, Johnny and Joe Dolan formed Sweeney's Men in 1966. Quite suddenly, in 1967, they had a hit single. Joe Dolan left and was replaced with Terry Woods. "That was the end of an era. Up until then we'd been very freewheeling, very happy-go-lucky. Now Johnny said, 'You know, it's a going concern, we are making a living!' "
" This was probably the point where I became a professional musician. It changed my attitude a little bit, but it hasn't changed anything else. The good times of Sweeney's Men were definitely the early days. After that it became a bit more of a job of work. We had another hit in 1967, and we made an album in 1968. I'd had enough by this time. I mean, we were playing in dance-halls - the money was good, you'd do about twenty minutes as a special spot in this night, but it was a gruesome scene, looking back on it!" Andy lasted for another year before a completely new interest took over. He was bitten by the travelling bug. "People realised that you didn't actually need money to travel. All you needed was a bit of wit and a passport. I wanted to go somewhere exciting, but I didn't want to go that far - I thought, that's a bit too exciting! I decided I would go to Bulgaria and Roumania, countries that were completely unknown. They had no tourist industry. So one bright May morning I set out from the North Wall in Dublin. Loads of people came down to wave me off." He and his girlfriend (later to be his wife) Muriel spent about a year and a half travelling around Bulgaria, Yugoslavia and Roumania. Talking about this period, Andy uses phrases like "it's all a blur", "we were really like a rolling stone". There was no fixed plan, just drifting about, sleeping rough, playing music, and learning about the music of his hosts. He carried a mandolin, and being a musician helped him get along with ordinary people as well as with border guards and the like. He found it quite hard to settle back into life in Ireland afterwards. The Dublin music scene had seen changes of its own while he had been away, and his tastes were again outside the mainstream. "I fell in love with Bulgarian music. I tried very hard to get people in Ireland to play this music, and other musicians used to avoid me because they were expecting me to say, 'Eh, come and play Bulgarian music with me!' like a loony." Alistair Russell heard him in Germany around this time: "I remember the young Andy Irvine, stopping off in 1971 to do a gig in Munich on his way back from the Balkans, about to join a new band called Planxty. The German audience was a little perplexed by his music at that time!" Another outcome of his Balkan adventure was the East Wind album, for which Davy Spillane joined him, but it probably isn't unfair to say that this passion for Balkan music has to a greater or lesser extent coloured everything Andy has written since. 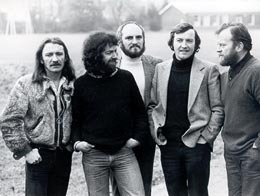 The rest is history, as they say: He became - and has remained - a major force on the Irish folk scene, whether as a member of Planxty and Patrick Street, in partnership with Paul Brady or as a singer/songwriter and guitarist on his own. In 2001 he won The Hall of Fame Award of the Fiddler's Green Festival at Rostrevor, and now he is off to new musical shores with his band Mozaic, a 'fusion' project. His partners in Mozaic are Donal Lunny, Bruce Molsky, Nikola Parov and Rens van der Zalm. They have toured Australia to great acclaim, and Andy hopes the band will be an ongoing project.